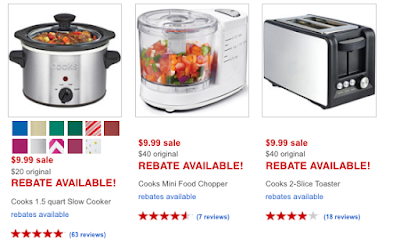 These select Cooks Small Kitchen Appliances drop from $40 to $9.99 at JCPenney.com. Then, send in this rebate to get $5 back, dropping your final price to $4.99. Shipping is free to your local JCPenney store when you spend at least $25 and free to your home at $49. Choose from three options, including the pictured Cooks 1.5 quart Slow Cooker, this Cooks Mini Food Chopper, and this Cooks 4-Slice Toaster Oven. Sales tax is charged in most states.